2.1 What Are Modafinil Benefits? 3.1 How Does Modafinil Work? 4.1 How to Take Modafinil? 5.1 What are Modafinil Side Effects? Summary: Modafinil is a powerful stimulant that promotes ‘wakefulness’ and treats sleep disorders. It prevents daytime sleepiness and fatigue, as well as offering nootropical benefits such as enhancing mood, increasing mental alertness, increasing motivation, improving reaction time, reducing fatigue, and even enhancing memory. In use by the French army, the American Air Force, the Indian Air Force, and Canadian astronauts….. (astronauts!) [R]. Modafinil is a powerful stimulant that promotes wakefulness and treating daytime sleep disorders such as narcolepsy – excessive, uncontrollable daytime sleepiness. Besides tats, it offers nootropic benefits such as enhancing mood, increasing mental alertness, increasing motivation, improving reaction time, reducing fatigue, and even enhancing memory. As a prescription medicine, Modafinil is available in the US, Canada, the UK, and almost every developed country today. It is also available in the UAE where I had it prescribed for a month. Aside from the original name, it also sells under brand names Provigil, Modvigil, and Alertec. It’s a eugeroic (a class of medical drugs that promotes wakefulness and alertness) used to treat conditions such as narcolepsy, a disorder that decreases the ability to regulate sleep-wake cycles, as well as the effects of shift work and similar sleep disorders. It’s used off-label by students, businesswomen, men, and shift-workers due to its nootropic effects. Although its effects are comparable to amphetamines like Adderall, which produce a temporary increase in cognition, Modafinil reports providing smoother and jitter-free energy. It also has fewer side effects and better toleration. Furthermore, it has low abuse and addiction potential. I don’t think I ever heard of any “Modafinil addict.” Definitely not Dave Asprey. It improves cognitive function by increasing wakefulness and enhancing mental performance during a sleep-deprivation state. Modafinil is useful for shift workers. It is used to help pilots staying alert throughout operations by the American military. Modafinil is powerful strengthening the ability to learn and expanding the capacity to process information. Research confirms that it reinforces mental endurance and performance, especially in cases of drug dependence and ADHD individuals. According to the clinical trials, Modafinil enhances mood, performance, response time and even memory in healthy individuals as well as those who are sleep-deprived. Experiments further suggest Modafinil promotes brain health. In brain tissue, its inhibitors properties decrease the manifestation of damaging free radicals, thereby making it an effective neuroprotectant (R), (R), (R). Although less of a featured trait, Modafinil seems to have the ability to reduce anxiety as well as decreasing anger. A result of the reduction it allows in the reactivity stimuli within the brain (R). There is a paradoxical study (R) for the curious cats like myself. The research shows that on the contrary, Modafinil increases aggression and anxiety in a subject taking a 100mg dose. When the treatment is doubling to 200mg, the items display a reduction in anxiety. It’s a case where less is not more and more is more. The unique mechanisms of action differentiates Modafinil effect from the traditional stimulants though they are similar. 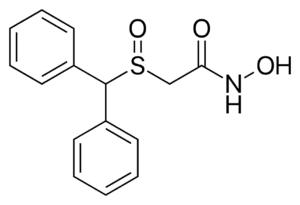 Modafinil activates neurons by focusing on the hypothalamus and amygdala, unlike amphetamine, methylphenidate, and other central nervous stimulants that only induce wakefulness by general widespread neuronal activation. The precise mechanisms of Modafinil action have not been identified regarding locating a single site of action, though it modulates the brain’s histamine, serotonin, norepinephrine, orexin, and dopamine systems. However, it is evident that Modafinil’s effect on numerous essential neurotransmitters is at the heart of its potency, both as a eugeroic and nootropic. Orexin neurons exist in the hypothalamus but project to many different parts of the brain including several areas that regulate wakefulness. Leading cause of Narcolepsy is lack of orexin, which Modafinil addresses by acting on orexin neurons. Activation of these neurons also increases production of histamines and other important neurotransmitters that are related to wakefulness and alertness. Histamine is known to allergies and local immune responses, it also plays an essential part in regulating the sleep/wake cycle. Modafinil actions elevate hypothalamic histamine, a known wakefulness mechanism. Dopamine is an essential neurotransmitter associating with stimuli/reward response, and therefore can enhance mood as well as increase motivation and focus. Modafinil works by blocking the receptors that remove dopamine from synapses, which raises levels of dopamine available for instant use in the brain. Unlike amphetamines, which stimulate the release and increase of dopamine levels in a high but rapid amplified manner. This indirect gradual action on the dopamine system is a primary feature of how Modafinil works in the brain. It decreases the “rush” type of euphoria that associates with addiction. Modafinil increases the availability of norepinephrine, a stimulant neurotransmitter that promotes wakefulness and increases alertness in the hypothalamus. How Modafinil increases norepinephrine levels isn’t clear. Modafinil elevates levels of glutamate, the primary neurotransmitter in the brain which is responsible for excitement, by activating the extracellular release of glutamate in the hypothalamus. Glutamate plays a crucial role in human’s psychological functions, playing a significant role in Modafinil’s enhancing effects. Such effects include increased memory, focus, and even brain modification. Not all that Modafinil has to offers is clear, but more than 40 years of extensive research reveals its powerful effects. Modafinil is well-absorbed with peak plasma concentration reached approximately two to four hours after administration. Food has no effect on overall modafinil bioavailability; however, absorption (tmax) may be delayed by approximately one hour if taken with food. Modafinil is moderately bound to plasma protein (approximately 60%), primarily to albumin, which indicates that there is a low risk of interaction with strongly bound drugs. Modafinil is metabolised by the liver. The chief metabolite (40 – 50% of the dose), modafinil acid, has no pharmacological activity. The excretion of modafinil and its metabolites is chiefly renal, with a small proportion being eliminated unchanged (< 10% of the dose). The effective elimination half-life of modafinil after multiple doses is about 15 hours. Modafinil is safe for continuous use at moderate doses (100-200 mg). Large-scale clinical trials show no significant indications of tolerance over periods of up to several months. What are Modafinil Side Effects? Commonly reported side effect of modafinil (although minor) can include anxiety, insomnia, headache, nausea, digestion issues, dizziness, diarrhea, dry mouth, and inflammation. Many of these side effects are temporary. If they persist, its advisable to seek professional advice. Everyone responds differently to nootropics, but decades of research have shown modafinil is safe, effective, and well-tolerated. If you’re into maximizing cognitive abilities and minimizing fatigue, modafinil is a nootropic worth trying. My personal experience with it has been very interesting and positive. I mostly noticed the massive interest in learning as well as the capacity to process information. Nevertheless, I still prefer Adrafinil over Modafinil, even though they are almost identical products. Modafinil is a medication that promotes wakefulness through a variety of mechanisms. Although Modafinil is structurally like central nervous system stimulants like amphetamines, its effects and mechanisms of action are notably different. Modafinil influences the activity of the neurotransmitters dopamine, norepinephrine, glutamate, GABA and serotonin. Dopamine is one of the neurotransmitters that seems to be most strongly affected. Modafinil inhibits the reuptake of dopamine through specific dopamine transporter channels but is very selective as to which ones it inhibits. Serotonin activity increases in both the amygdala and frontal cortex with Modafinil use. How Long Does Modafinil Stay In Your System? Modafinil is a medication that promotes wakefulness. It’s prescribed to treat narcolepsy, hypersomnia, obstructive sleep apnea and shift work sleep disorder. Modafinil is widely used off-label as a cognitive enhancing drug. Individuals who use Modafinil as a cognitive enhancer claim that it dramatically improves focus and concentration, especially when taken to counteract fatigue. The effects of Modafinil are long-lasting compared to other medications. The half-life of Modafinil ranges from 12 to 15 hours, although the metabolism of Modafinil can be affected by several factors, including genetic predispositions, kidney and liver health. Allergy and hypersensitivity are the only contraindications to using Modafinil. Scientists are still trying to understand precisely how Modafinil achieves its effects. Modafinil targets several neurotransmitters, including dopamine and norepinephrine. How Long Does Modafinil Stay In Your Urine, Hair And Blood? Depending on various factors, urinary excretion of unchanged Modafinil ranges from 0 percent to 18.7 percent. Most Modafinil is excreted as one of two major circulating metabolites: modafinil acid or modafinil sulfone. Modafinil and its metabolites may be present at testable levels in the urine for up to 30 hours following ingestion. Modafinil and modafinil acid can be tested for in plasma, serum and urine. Modafinil is not usually tested for in routine drug screenings and its use is unlikely to cause false positives for stimulants such as amphetamines. If you’re in Abu Dhabi/Dubai, you can order Modafinil through our page here. However, if you are somewhere else, although I know a few websites that advertise it, I never have personally bought from them nor trust them enough to list or recommend them. You can try by doing a Google search, and be cautious, and learn about its legal status in your country of residence. Back to Nootropics Information homepage. Summary: Phenylpiracetam is a potent and fast-acting racetam type nootropic. It enhances cognitive abilities and boosts physical strength, stamina, energy, as well as reduces symptoms of depression and anxiety. Being stimulatory, it is banned by the Olympics Anti-Doping committee to the participating athletes. Phenylpiracetam (also known, and sold under the brand name Phenotropil) is one of the most effective, most efficient and most potent racetam nootropics which is widely used, and have been available on the market for many years. With the safe and effective use, many regards Phenylpiracetam a “lifesaver” and “faithful companion” in times of need. Quite dramatic descriptions. Although it is a new nootropic in comparison to classic racetams such as Piracetam, over the past few years, it gained popularity due to its practical use. Phenylpiracetam – as the name indicates, is a derivative of piracetam, with the phenyl addition. Which is why it shares so many properties with piracetam. However, it seems to be much more powerful. It is anywhere between 30 to 60 times more potent, and therefore effective, in its action. Phenylpiracetam is quite popular for its neuroprotective properties which are the dominant feature of many racetam nootropics. But in comparison to piracetam, its neuroprotective attributes are more effective. It is also psychostimulatory, in other words, it is a stimulant. For that reason, Phenylpiracetam enhances physical performance, which is the primary reason behind its increased consumption among athletes. Due to these attributes, Phenylpiracetam has become a favorite amongst other nootropics, and its sales have also increased over the past few years due to the positive response it keeps receiving. “Ninety-nine patients with encephalopathy developed in the remote period after acute lesions of cerebral blood circulation, brain traumas and cerebral gliomas surgery have been studied. Phenotropil was used in a dosage of 200 mg per day during one month. A study patient with chronic fatigue syndrome finds that a one-month treatment of phenylpiracetam reduces fatigue notably. The study included 1170 patients with brain ischemia, aged 45-65 years, treated with phenotropil in dose 100 mg during 2 and 3 months. Clinical examination and MFI-20 subscales were administered. Anecdotal reports claim It was used by Russian soldiers and astronauts to achieve high physical strength and mental abilities. Although it makes sense and I do believe it personally, those studies are very hard to find due to having taken place a very long time ago, and in another period of time, and another language (Russian). 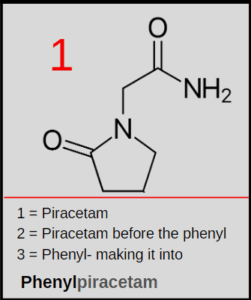 Phenylpiracetam is a piracetam which comes with a phenyl group attached to it. It has similar functions and potency as that of piracetam, which is its parent molecule. However, the addition of the phenyl group has increased its effectiveness in many ways which have led to the increased usage and exposure of Phenylpiracetam in the market. Furthermore, it easily crosses the blood-brain barrier. Thus it has CNS effects. Most users compare its impact to that of Adderall and modafinil. It is more potent than other racetams and has a high bioavailability, making it a great first line agent to take in case if you are having an exhaustive day ahead. Its half-life is about 3-5 hours. No mechanism is in the documentation for the action it produces and the way it processes them and makes them work. However, it has energy and performance boosting properties, and it has a close resemblance to phenyl-ethylamine, which has stimulatory effects. Phenylpiracetam has a close affinity with neurotransmitters such as norepinephrine and dopamine transporters. The general Phenylpiracetam dose is usually 100 to 200 mg per dose, and can be taken in up to 2 to 3 doses per day at max. Although I wouldn’t go that far myself. The higher end is often for specific conditions and are less frequent than the lower end dosage. Personally, I prefer taking one 200 mg dose, once only. The effects are much more present and pleasing at that dosage. I feel like anything more than 200mg would be too stimulatory for me, especially given that I often take it along with other nootropics as part of a stack. Its also important to note that Phenylpiracetam tolerance builds up quickly. Therefore, minimize your use to when you need it rather than making it a part of a daily stack. Once to twice per week is a good practice. Phenylpiracetam is taken at a dosage of 100-200mg acutely, and this dose is taken 2-3 times per day (totalling a daily range of 200-600mg). The lower range seems effective, but the optimal dosage is not yet known. The R-isomer appears to be more active on the common usages of phenylpiracetam (stimulation and cognition) than does the S-isomer, and while the racemic mixture (commonly sold version) is effective for cognitive decline it is not certain if it works for nootropic purposes in youth. What Are Phenylpiracetam Side Effects? The major issues and side effects that appear with Phenylpiracetam are the same that occur with other racetams. The most common side effect of Phenylpiracetam is a headache. which is due to the choline reserves depletion. Using a choline source such as Alpha-GPC or Citicoline would quickly resolve the issue. Due to that, I try to always pair Phenylpiracetam and a choline source together instead of waiting to see whether or not I am going to have a headache. That, plus I wouldn’t mind the potentiating boost of the additional choline. Rarely reported side effects are related to the GI tract, such as digestion issues, and constipation. This is a great product, don’t get me wrong. Personally, however, my tolerance built up almost instantaneously. First use was wonderful, worked exactly as advertised. Took it a second time 2 days later. Still felt the effects, but was noticeably diminished. Waited a week before taking it again and felt like that first use. Decided to take it the very next day and felt it somewhat, but hardly. Abstained for a week and decided to take 2 in the morning. The effects were comparable to the first time. Took the same dose 3 days later and didn’t notice the effects at all. Waited a week before taking it again, took two again and felt the effects like the previous week but it wore off rather quickly. Since then I’ve only taken it once a week in the latter part of the day when I work a double at my job. This product definitely works, but in my opinion should be used very sparingly. I acknowledge the fact that I tend to develop tolerance to most substances quickly, so if you consider yourself to have that same trait this review would likely apply to you. Phenylpiracetam without a doubt works, and quite well at that. This was my introduction to the racetam family. I’m eager to try the others now, but wanted to start with one that provided an energy boost. I definitely picked the right one. Within an hour after use you will feel the effects, and they last around 5 hours for me. Sometimes I would take 2-3 capsules instead of 1, and it never made me feel jittery or anxious like too much caffeine would. Highly recommend this product if you are looking for a clean boost in energy and motivation. Works well along side caffeine in my opinion as well. Phenylpiracetam has attained the attention and popularity among the nootropic users for its powerful, dynamic impacts and effects. It is a potent activator of the CNS activities. Its ability to increase the energy and physical performance have made it a favorite for many in the field of study and sports as well. As time passes, these highly active ingredients are only going to gain more attention. What is Phenylpiracetam used for? Does Phenylpiracetam get you high? Phenylpiracetam boosts memory, cognition level, stamina and energy levels. Having those benefits to someone who has deficiencies in one or more of them would lead him to experiencing a euphoric state, which many people may refer to as being high. Therefore, ultimately, the answer to the question of does phenylpiracetam get you high would be yes. Yes, in comparison to the general nootropics, Phenylpiracetam is considered to be stimulating nootropic. Moreover, Phenylpiracetam is banned by the World Anti-Doping Agency (Olympics) due to its reported psychostimulatory and cold resistance properties . But it is not a hard stimulant like amphetamines, methamphetamine, and other pharmaceutical & street drugs. It would be the better alternative – although its not recommended for day to day use due to quick tolerance-building. Ideally, taking Phenylpiracetam once to twice a week is the best way to use it without worrying about tolerance build-up or abuse potential. Phenylpiracetam legality status depends on country to country basis. In the US, Phenylpiracetam is uncontrolled, unscheduled compound. Which means it is legal to buy and posses. While in Russia, Phenylpiracetam is a prescription drug (sold under brand name Phenotropil). Therefore, in Russia, you need a prescription to legally posses Phenylpiracetam. How much Phenylpiracetam should I take? It’s also important to note that Phenylpiracetam tolerance builds up quickly. Therefore, minimize your use to when you need it rather than making it a part of a daily stack. Once to twice per week is a good practice. What is the best way to cycle Phenylpiracetam? Avoid taking phenylpiracetam for more than two consecutive days. I’ve found that by day 3 tolerance develops, even if I’m taking low doses (e.g. 50 mg). A solid schedule might be taking phenylpiracetam every other day. Better yet, twice a week only. What does phenylpiracetam stack with? Aniracetam, low dose of Noopept, Alpha-Gpc, Lion’s Mane Mushroom. Many other nootropics as well if you are only taking one phenylpiracetam capsule of 150mg. But in general Phenylpiracetam stacks well with most nootropics. Though most frequently its stacked with cholinergics. Why do many people prefer phenylpiracetam to piracetam? Also: The stimulant qualities, which disappear after regular use. I estimate it is at first like one strong cup of coffee, weakening on subsequent doses. I think that is the reason that phenylpiracetam hasn’t replaced piracetam altogether. The advantages of phenylpiracetam have to be weighed against the greater cost. For daily or at least regular use, the price point of plain piracetam is better. What Is The Difference Between Piracetam and Phenylpiracetam? Phenylpiracetam is the same chemical structure of Piracetam, but with the addition of a large phenyl grouping off the 4 position of the pyrrolidone ring that all racetams share. Phenylpiracetam has very low water solubility but is slightly lipid soluble. The LogP of Phenylpiracetam is .16, and its solubility in water is 1-2mg/ml at 25 Celsius. The melting point of phenylpiracetam is 149-152 Celsius. 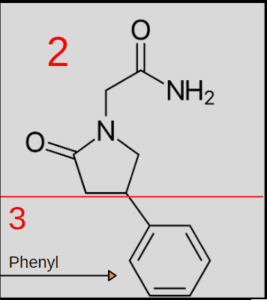 Phenylpiracetam also has a stereocenter, meaning it can come in both R and L enantiomers. All phenylpiracetam available is racemic, or a 50/50 mixture of both enantiomers. Return to Nootropics Information homepage. Summary: Adrafinil is the pro-drug of Modafinil, and a stimulating nootropic that fights fatigue, increases the brain’s capacity of processing information, boosts energy, as well as enhances subjective well-being. It metabolizes in the body into the widely popular Modafinil (Adrafinil vs Modafinil comparison below). It’s a useful supplement for pulling through long, mentally demanding tasks, learning new topics, or working in shifts as opposed to fixed schedule. Adrafinil is a synthetic nootropic supplement that acts as a central nervous system stimulant. Previously known as Olmifon, and often mistaken with Modafinil, it is a stimulant that does not produce amphetamine-like effects. It is a precursor to Modafinil. That means it leads to increased concentrations of modafinil in the body. Adrafinil combats fatigue, boosts energy, improves attention, concentration and focus. It’s also known to enhance mood, motivation, and reaction time. Its potential cognitive benefits extends further to improving memory and increasing the brain’s capacity of learning, digesting, and processing information. A 1970’s invention by French pharmaceutical company Lafon Laboratories, which manufactured, branded and marketed the invention in Europe under the name Olmifon. It spread throughout Europe and became widely prescribed by practitioners for narcolepsy and related sleep disorders that has symptoms of heavy and excessive daytime drowsiness. As well as widely used off-label for its nootropic and stimulating effects. In 2011, production of Olmifon ended when the french regulating authorities reversed its legality. Adrafinil is a eugeroic that was formerly used in France to promote alertness, attention, wakefulness, mood, and other parameters, particularly in the elderly. Many people often compare adrafinil vs modafinil upon hearing of it. Usually because they try to get modafinil and find out its prescription medication, so they go for the non-[rescription, online-available alternative. What popularizes it the most as a nootropic is the fact that its the closest legal, prescription-free to the “limitless” modafinil. But for those who knew and were familiar with it before this movie association know its profound effect and can differentiate between it and that of modafinil. In fact, many users actually report preferring adrafinil vs modafinil for certain, slightly different nootropic effects that each produces. Although Adrafinil metabolizes into Modafinil after ingestion, it still requires a higher dosage to reach the level of effectiveness that one would feel from modafinil. For example, modafinil is mostly prescribed in dosages of 100 to 200 mg. Adrafinil often sells in the lowest dosage being 300mg. So in order to achieve the same concentration level of modafinil using adrafinil, one would have to be aware of this and measure the dosage following that pattern, as required. Modafinil is often prescribed therapeutically in doses of 50mg being the lowest effective. For comparison, taking 300mg Adrafinil, which is the smallest manufacturing dose, would actually be more effective than the lowest effective dose of modafinil. Although it cannot be an exact figure due to the fact that breakdown and metabolizing varies from each individual to another, a general and easy way of understanding and remembering the math of adrafinil vs modafinil in terms of dosages, or at least how I personally measure it when taking either one, is that that 100mg of Modafinil is more or less equals to 300mg Adrafinil. From my personal, own experience: the effect of Adrafinil 300mg is much more felt in comparison to Modafinil 100mg. During the period I was prescribed Modafinil, I would have to take 200mg in order to achieve what I would achieve from 300mg of Adrafinil. Although it is initially developed for its wakefulness-promoting qualities, Adrafinil continues showing significant cognitive benefits as well. For individuals suffering daytime exhaustion due to night work or sleep difficulties, adrafinil increases the physical and mental energy required for an active life. It also improves mental clarity and heightens focus. Adrafinil is an overall beneficial stimulant, preventing daytime drowsiness and dramatically increasing energy and attentiveness without the hyperactivity and jitteriness associated with stimulants. Users report a profound sense of well-being, stress reduction, and overall enrichment experiences. Those outcomes are primarily due to Adrafinil’s impact on dopamine. In addition to promoting wakefulness and increasing energy, adrafinil holds many nootropic benefits such as improved learning capacity, better memory creation, as well as recollection. Reports indicate that it sharpens focus and increases the ability to maintain it, along with providing mental clarity, and easing mentally demanding work, especially that which extends over a prolonged period. Adrafinil acts on the adrenergic system, the part of the nervous system that releases adrenaline. Typically considered in charge of the “fight or flight” response, a rapid release of adrenaline boosts energy and increases alertness. 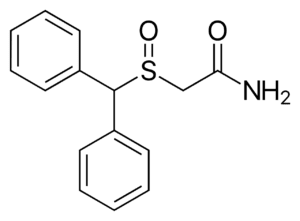 While not all of adrafinil’s actions are entirely understood, it is assumed to replicate the positive effect of adrenaline release by supporting adrenergic neurotransmitters. Adrafinil is a synthetic prodrug, which means that its an inactive compound that metabolizes into an active form inside the body. The process of metabolizing it produces the drug, modafinil, which is an FDA-approved treatment for necropsy and similar sleep disorders. The pharmacological effects of adrafinil are practically identical to those of Modafinil. Though the exact chemical mechanisms of it are unclear, researchers hypothesize that in its metabolized form it functions as an adrenergic receptor agonist. One of its first actions is the enhanced production and release of the neurotransmitter hypocretin, which in turn triggers the increased production of dopamine, histamine, and norepinephrine; all of which are directly related to alertness and energy, which considerably explains adrafinil’s stimulant qualities. The remarkable mood and cognitive effects it produces result from different actions, such as the positive modulation of glutamate receptors, and inhibiting the breakdown of glutamate. Those actions lead to better neuronal communication, which improves memory and focus and creates better cognitive functions. It also stimulates the release of serotonin, which enhances mood by reducing anxiety levels. It also inhibits the breakdown of dopamine, a neurotransmitter that is mainly responsible when it comes to the brain’s pleasure and reward responses. Typically, Adrafinil is manufactured and produced at the dosage of 300 mg. However, most nootropist would say, and prefer, a dose of 600mg taken once in the morning. While the highest, yet credible, dosage is 1,200 mg per day, taken as two doses. A morning dose of 600 mg and an afternoon “boost” of another 600mg. At 300 to 600 mg, it is a safe and very effective, mildly stimulating nootropic. Its potent, therefore it’s advised to start with lower end and allow your body the time to adapt to it. Once you familiarize yourself with it, you can then gradually increase as you desire while keeping in mind not to go over the daily recommendation of 1,200 mg.
I’ve taken Adrafinil frequently over the past year or two, but never more than 600 mg per day. And even the times I took 600 mg were so few, I’m almost sure it was less than 4 times in total. Due to its potency and wakefulness-promoting properties, it is advisable to take it in the morning or early afternoon only to avoid interfering with the sleep cycle, otherwise you wouldn’t be able to fall asleep easily at night. It is also advisable to take it on an empty stomach to allow for optimal absorption. It kicks in around 45 minutes to an hour after ingestion. For continuous and prolonged use, it is very advisable to use on a sequence (or cycle) of two weeks on, and one week off to detox and maintain tolerance as well as prevent potential dependency for certain people. Adrafinil dosage recommendations vary greatly among different users. The daily dosage that is recommended is between 150 mg to 300 mg. It is a strong Nootropic, and people are usually advised to start off with a small dose and allow the body to adjust before working upwards. It is not advisable to take this drug for long-term use. But then you should take it in cycles. For example, one week on, two weeks off and so on. This helps to prolong its effects without the bodybuilding too much of tolerance level. It is also very important to consult the doctor or qualified healthcare provider if planning to use it for an extended period of time. Without doing this, it may be disastrous for the liver as the supplement is known to elevate particular enzymes within the liver. What Are Adrafinil Side Effects? The most typical side effects of adrafinil are headaches, dizziness, nausea, and stomach discomfort. The most severe relates to liver function. Additionally, there is potential for increased risk of high blood pressure and heart problems when taking high doses. Should you experience any side effects, stop using and seek professional medical advice. Where Can I Buy Adrafinil? I can only recommend products I personally tried, and in the case of Adrafinil, I only bought and tried Nootropic Depot’s 300 mg Adrafinil capsules. Although I’ve seen it available in a few different websites, there was always something sketchy about the website, or negative reviews about the vendors adding some unknown fillers to the products. And surprisingly, I actually found that I prefer Adrafinil over Modafinil greatly, even though I’ve always (on the occasions that I took it) maintained a dose of 300mg once per day only. If you decide to purchase from another vendor, make sure you research, find out more information about them from Reddit’s nootropics forum, find reviews on google and whatnot, before making a transaction. Adrafinil’s mixture of mental and physical benefits make it valuable for individuals looking for more energy, stamina, and psychological acuity. Its a powerful nootropic with potent stimulant qualities. Used responsibly, it offers a unique and profound nootropic boost that one grows to appreciate. What is Adrafinil used for? Adrafinil is a prodrug; it is primarily metabolized in vivo to modafinil, resulting in very similar pharmacological effects. Unlike modafinil, however, it takes time for the metabolite to accumulate to active levels in the bloodstream. Effects usually are apparent within 45–60 minutes when taken orally on an empty stomach. Can adding Adrafinil to a daily Adderall regimen for ADHD help? Speaking from experience, J. Robert says: I had been taking a moderate level dose of adderall and experiencing the typical side effects associated with it. I researched Modafinil and took trail doses after discussing with my psych. I have since lessened my dose of adderall to a minimum 15 mg prn and am primarily on Armodafinil(the adrafinil/modafinil successor) now hoping to remove the adderall component in the near future. My experience has been overall positive. I am more focused cognitively without the overall body stimulant side effects I was getting from the adda. The one negative for me is sleep difficulty if the dose is taken later than upon getting up in the AM. Nootropics Information is a data-driven, progressive collection of credible information on nootropics, covering usage, benefits, effects, mechanism of action, dosage, potential side effects, and user experience. Accessible to everyone freely, and easily.